Another car breaks the 1,000 rwhp mark ! Thread: Another car breaks the 1,000 rwhp mark ! Who would have ever imagined that there are two of these around?!?!?! Take a look at this dyno video....as it should set the tone for just how nasty it is!! Dyno session took place on July 13th, 2011. 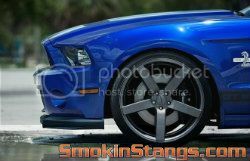 SmokinStangs.com took all the provided pictures & video shown here. This is one little....nasty creation. Ultimately Laid down over 1000rwhp. This was 1st pull on the dyno, and they got out of it. If memory serves me correctly it's a 1982, and runs in the 6's at around 230mph at the big end! If that isn't incredible enough...The body is totally in immaculate condition, through and through. Sure it's not a Mustang...but as horsepower junkies we surely can appreciate this impressive, wild & unique creation. To spool up that massive turbo off the line.....they look to the purple tank for that!! yes there is 2 cars just slightly different in color........the cream colored one runs in the 7s and the gold one runs 8.0's ...all of those guys have worked very hard to get the 2 cars completed and running.....great group of people !!!! The Prius is in for a Hellion system! on 6/23/2012 in Epping, NH. Car ended up back together shortly there afterwards .